kandeej.com: Fashion Friday & A Contest! 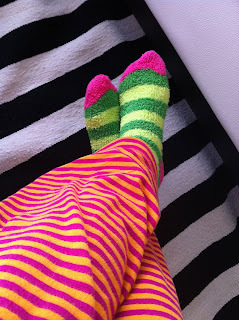 Hot off the runway...or rather my hallway...are my "yo gabba gabba"-esque jammie pants and fuzzy socks! 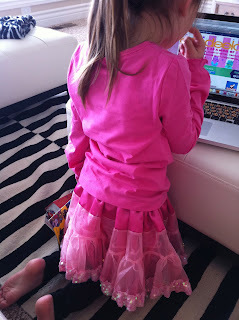 Alani's fashion choice for today...her Strawberry Shortcake tutu skirt...and she had removed her Cinderella "plastic" glass slipper, dress up shoes here! 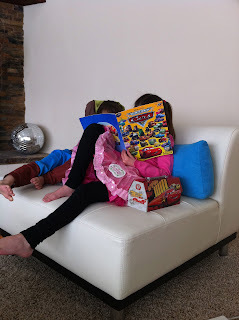 and here is Miss Lanzi reading blaker his Cars sticker book...with his Cars toolbox...someone really loves the movie Cars! I won't be there...too soon after lil Cupcake is here! BUT The Make-Up Show is offering a fun CONTEST!!! ANYONE CAN ENTER...you don't have to be a pro make-up artist or blogger....you cab just be fabulous you! The amazing opportunity to get a sneak peek at all The Makeup Show LA before anyone else. A chance to meet and get, networking, blogging, and other social media advice from James Vincent, Koren Zander and Pursebuzz with Crown Brush and Victoria Stiles. The opportunity to network with 50 other bloggers and recieve a special blogger preview goodie bag. You may tweet as many times as you like and you may enter more than one contest at a time. Love Old Navy!! I have some stripy socks like that too!!! 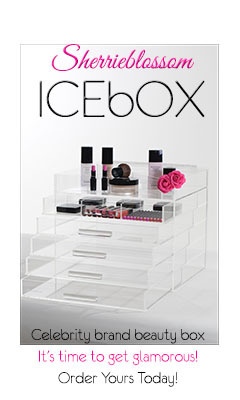 Just ordered some stuff online from there!! haha! Have a great weekend! I have the same colorful socks from Old Navy. They are too cute and soo comfy!!!! Awsomeness! Hey btw makeup artist magazine did a short spread on the imats toronto, and you where mentioned! and a quote. Also there is a pic with you and a fan. How cool is that?! I've been so inspired by you Kandee!!! You are such an amazing person. I decided to start a blog, just sort of about my life but I'm going to add some fashion and beauty into alot of it :) I'm trying to spread the word so people will visit my blog, here's the link! please please please visit and come back!!! p.s. and Kandee i love everything you do, your videos and your blogs, have truly inspired me to not be afraid of what people think and that i can go catch my dreams!!! Fuzzy comfy socks & pants! Now that's what I'm talkin about!!! Errrrrrr...or what you're talkin about! HA! So sweet to see Alani reading to Blake. lived in LA sometimes...or nearby at least. Gonna check out that contest now. Just wondering if maybe there could be a tutorial on how to make your own feather earings..? I stumbled across your youtube awhile back, because you were making the anchor necklace.. Though it might be a fun thing? With a new baby, I'm sure it will not be that easy right now.. Just a suggstion.